When my time in Berlin is over (if that ever happens) one thing I will be forever thankful for is how it has allowed me to become more open to other cultures. I used to think I knew a lot about other cultures when I still lived in Ireland, but in reality I was quite ignorant. Not that there is anything wrong with loving your own culture and being content in what it offers, I think I was just too immersed in Ireland and being Irish. A few years before I left was when many Eastern Europeans and African nationals began moving to Ireland. I worked with some lovely people from these countries and thought my friendliness and the few off questions about their homeland was enough. Not really when they tried so hard to fit in with us. As much as we probably hate to admit it, we are Europeans now. It has its ups and downs I am sure some will argue, but it has opened up many doors for us in the sense of learning more about our neighbours, their customs and traditions. This is a great opportunity for those who have the interest. This post is gathering a lot of depth quickly here so I feel the need to simplify it. Let’s exclude any arguments about employment, state benefit, etc. Instead, focus on the music and cuisine of others – two things we can all enjoy. Last weekend I went to a Brazilian festival here in Berlin which was set up to celebrate a land of people situated far away. And to highlight the coming World Cup. 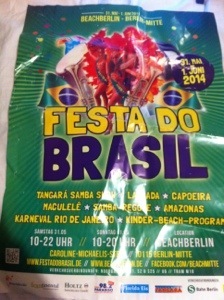 It was held in Beach Bar Mitte and it was a fantastic day and night. 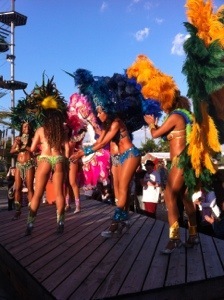 There was a Zumba class, samba music, amazing dancers and wonderful musicians. There were some independent retailers selling traditional caipirinha cocktails, mouth-watering dishes and beer mixed with mate. Five stars were given by me for each one. My dancing however was more like a one-star show. The place was full of different nationalities having a great time. It opened me up to things I really enjoyed but had never taken the time to appreciate. I ate a spicy rice and potato dish that evening which was delicious but like dishes I have eaten from other countries. This brought back home for me the realisation that we are all different, but all alike at the same time. I never experienced anything like that in Cork. What a pity. I think I would have had more interest in languages and other food if I had the chance to attend such events. I am not targeting Ireland in particular here, or any individuals. Besides the great time I had, all I want to do is highlight that this is a changing world. Let’s open ourselves up to more in life and be pleasantly surprised. I know I sure will.